Here is a very simple project, a hummingbird feeder. I needed a simple project. My New Years resolution was to finish one of the many books I have been working on. Mid-February I got started. I vowed to focus all free time on the effort until it was up and available to readers. September came and I have put one book up on Amazon Kindle, I am editing the second and writing the third. Having gotten that out of the way I desperately needed a simple woodworking project to ease myself back into the swing of things. A throwing stick for a dog is perhaps a simpler project than this one. Not much else is. Two holes in a block of scrap wood and one hole in a dowel. That is the labor involved in this project unless you want to get fancy. A wonderful guide to wood. 100 birds carved from 100 different woods. Rodger Hargrave is as far as I can tell, not just an expert, he is the expert. He makes violins, really good violins. As far as I can tell, perfect violins. But that is not all. He has a quick wit, amazing skills and serious expertise. All this and he has gracefully shared his methods. He is generous enough to banter with the likes of me on Maestronet When he is not earning a living producing masterpieces, he often shares his knowledge in detail and generously. So if you want to visit the best, then by all means go to his website. But the real meat of this post is that he has recently made available his book detailing the making of a double bass. This is the real deal given freely by him under Creative Commons license, here is the link to his library. So if you want a detailed walk through to building a true master work, here it is. A master work detailed by a true living master. The read only version, in PDF form. The Version for printing a Book, also provided in PDF form. Roger Hargrave requested help in distributing his book. Who am I to protest! Christophe Mineau is a kindred soul and an amazing craftsman who is nine years younger than I am and a hundred years ahead of me in craftsmanship! His musical instruments are a delight, his tools a wonder and his methods are solid and clever. His website is in French and English, so you can enjoy his work in two languages. There is really no point in my going on and on here, although there is a lot to go on and on about. Go to his site and enjoy! If you read my previous birdcage awl post, you might recognize this tool. 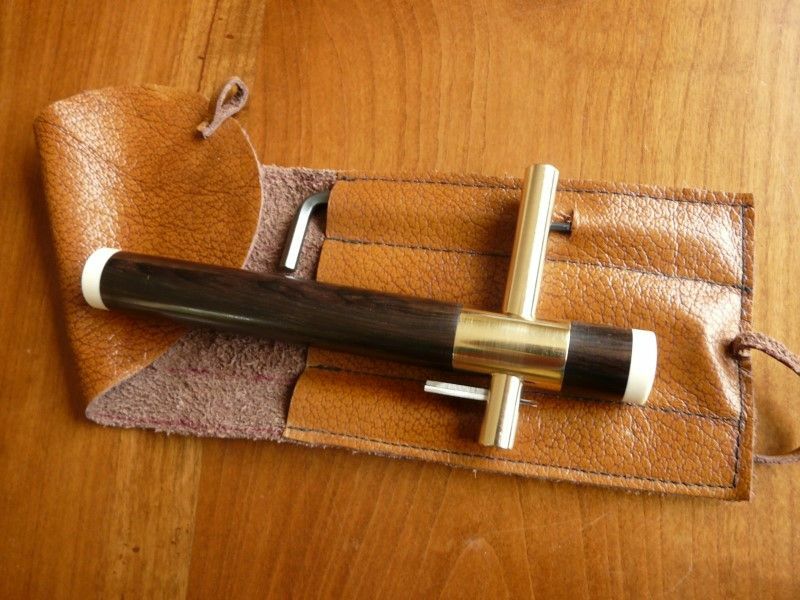 This was the real purpose of the tool, it is a fun and convenient twist that this tool also works as a pocket birdcage awl. This will allow a straight edge burnish and angled burnishes. This is ideal for curved burnishers. The rest of the post is about cookies and games, so ignore the [MORE] if you are just here for the woodworking!